I have seen many bloggers have been using headings in their posts. I mean, not post titles, but headings used in their posts. Headings are very strong and effective in posts, if you use them meaningfully. Take a look at newspaper articles and see how attractive they are sometimes to get your attention. Headings can be used to give a clue to readers or reflect what they about to read. Obviously, you can use different kind of headings with different wordings, meanings and formattings. Simply different ways to get attention. Personally, I did use sort of headings without giving clues to readers in some posts. Writing is an art, make use of it in your own way without spoiling its true meaning. Here I'm not going to refer "How to Use Best Headlines". Well, My friend Sylviane Nuccio has a post written about usage of effective headlines which helped me improve my blogging experience. As I explore and read online, I noticed some bloggers using headings but not quite effectively. I mean not about the meaning of headings or how they were phrased, but they weren't aware of using HTML header tags for their headings appears in posts. Obviously, the readers would be able to identify them as headings by just looking at them as they differentiate from normal text. But search engine bots and automated tools such as news aggregators can't. Aren't We Suppose to Write for Readers? What are HTML Header Tags? 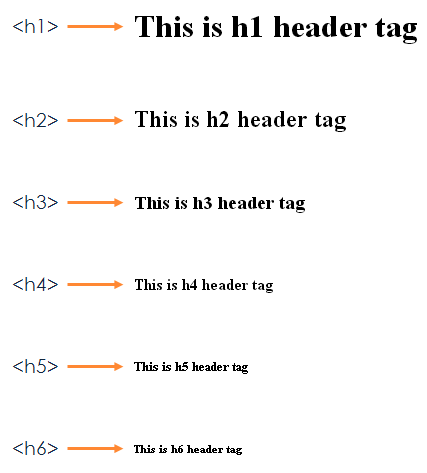 Standard HTML header tags are as follows - <h1>, <h2>, <h3>, <h4>, <h5>, <h6>. Simply, their sizes are different. They are meant to use in different levels. For example, <h1> tag used for top-level headings. Under that <h2> headings. Next level is <h3> and so on. Below you can see how they are looks like. Though <h1> is used for top-level headings, in blogging and writing online, <h1> tag would be used for post or article title as a standard. So headings used in the content would start with <h2> header tags and you can use up to <h6>. Obviously you can change sizes of header tags if you need to. 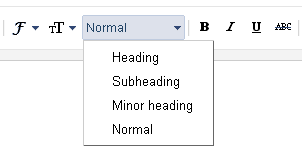 If you are in Blogger blogging platform, you can easily define header tags for headings without manually tagging them. Use heading options in Blogger Post Editor and your headings will tag automatically. Here's available heading options in Blogger. The use of HTML header tags for your headings would be helpful for search engine bots to index your pages in structured manner. Once bots identify your headings defined with header tags, they will assume your headings represent content beneath them. So as search bots index your pages in structured manner while noticing headings you have been using, search engines could serve better for web searchers. So it will be a plus point in SEO too. However if you don't use header tags for headings, search bots will just treat them as normal text. Not only search engines, but also tools such as news readers where people use to read blogs, make use of headings defined with header tags. Such tools are capable of identifying headings and automatically build a heading list for readers to navigate through the post easily. It will improve reader experience. So instead of using styled or formatted texts, using header tags for headings is very productive and your content will be well formatted. 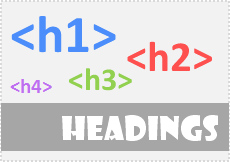 Actually, HTML header tags were introduced to define headings for online content. But sometimes people weren't aware of that. Now you know the advantage of using header tags. Your content would be search engine friendly with that. That's where I need to refer now. Though usage of headings has a SEO value, just don't start to use headings in each of your posts or articles blindly. Use headings to structure and guide your readers through the post or to get attention. You can experiment with that, but don't abuse it. Make sure you are adding value to your content with headings. I haven't seen misusing of header tags yet. Anyway, don't use header tags for any other purposes. Don't use them with normal text to emphasis somethings. In that case, you can use some styles or different font sizes. Just use HTML header tags for your headings only. I hope you got the idea of using header tags for your posts or articles. Here I'm not encouraging you to use headings everytime. As I have seen bloggers misusing it, my intention is to help you to use header tags appropriately when writing content. Just a little help. Eventually it will improve accessibility of your content and it will be more SEO friendly too. If you have more tips on using header tags, I'm all ears. Oh yes...I totally agree that when I visit a blog post that has got only text with no breaks or headings, I am totally put-off and might not even read through the entire post if it doesn't sound interesting. I love to have small paragraphs and if possible with smaller headings or these HTML header tags as you mentioned. When I was on Bloggers, I wasn't really aware about these nor about SEO, because I was just writing what I felt. However, once I learnt about them, I've been using them on all of my posts. Absolutely Harleena :) As I mentioned, the standard is to use one H1 tag per page when it comes to blogging and article writing. H2 goes for inner main headings and other headings follows. I agree on using H4 and so forth :) It's very rare though we can use 'em. But believe me I've seen 2 posts dear ;) They were very lengthy posts (May be 4000 - 5000 words) and used all of headings to break whole picture into sub topics. However they had to change heading sizes. As you mentioned, header tags from H4 to H6 can be used for sidebar widget headings and so dear. I think that's what you implied by mentioning links :) It's a usual practice nowadays. Well, it's better not to use header tags for actual links or text on sidebar or footer though. Instead you can use bold or font size options. I love seeing headings in posts, it helps break up the info for me and is easier to follow along. I've been adding more myself lately too. It also makes the blogs look more professional. I've gone as low as h4 in some posts (longer ones). It's nice to know it has also some SEO benefits too, we can use that, right Mayura? Thanks for sharing this one on headers. Great post Mayura! I try using them in my post when I really want to emphasize something or break up the post a tad. This is a great tutorial. Definitely sharing! Hi Mayrua, Great article. I knew that header tags helped search engines index articles, but I had never read such a thorough explanation. Like Harleena, I don't go below H3 in my articles, but I do use header tags frequently. These tags help not only the reader, but they help me see the outline of my article very clearly. Thanks so much for sharing your insights with us! Thank you for coming and letting me know how you use headings at your place dear :) Ah... Thanks for your compliments too. Ha ha... Well, I'm not a writing expert ;) But I just wanna mention the advantage of using header tags for headings dear. I've seen bloggers just use text for headings with increased size. So I hope this little help will improve their blogging experience. Ha ha... I'm not encouraging you to use headings always :) But you can structure your post well with 'em. Yeah dear, usage of HTML header tags for headings makes things easy for search engines too :) So instead of styling, remember to use appropriate header tags there. Again you show your expertise on knowing your stuff - especially with blogger! But f cource these rules apply for other blogging platforms to! Great job! I recently read a post that shared why having subheadings in your post were important. I'd read about that some time back because it breaks up the posts. I really must admit not enjoying just reading text that seems to go on forever. I love WordPress myself because it's so easy to include header tags and I only use one, two and three for the most part. I have to agree with everyone here Mayura, you definitely are very thorough with your explanations of things so I want to thank you for that. These are the types of tutorials I so enjoy. Thank you Mayura for all that you do in educating us on things we sometimes just aren't familiar with. Well, I was a blogger writing with no headings. I started to use 'em once I read about headings at Sylviane's place :) Now I glad I start using headings. Hope this one helps 'em to get better with using header tags and others not to misuse or abuse header tags dear. A nicely explained post. I want to know about H1 tag. When I inspect my website element I did not found any H1 tag instead my title was written in H2 tag by default. So can I use H1 tag in anywhere else in the post when required?